I am loving this festive break, I have painted every day, finished many paintings that had been sat waiting to be completed, and today I painted Ginge, my sisters Norwegian forest cat, who is truly a living bagpuss ( the kids tv pink tabby cat from the 70’s). Most attempts at painting cats, don’t go my way, but today I achieved two things with this painting, first, it’s a cat! Second I managed to create the loose free style, with an abstract feel, that I have tried and failed so often. Feeling happy, thanks to ginge giving the purr-fect pose! 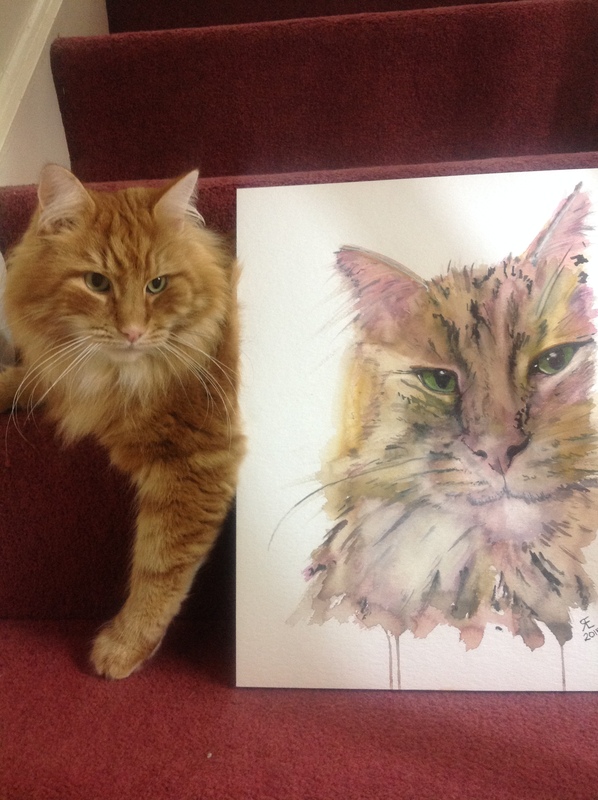 ‘Ginge’ abstract watercolour Norwegian forest cat. This entry was posted in art, cat, norwegian forest cat, Uncategorized, watercolour and tagged art, bagpuss, cat, norwegian forest cat, painting, Painting, watercolour. Bookmark the permalink. Thank you, he is a giant soppy sag puss! mine likes water, is a ‘Chatterbox’ & is a mama’s boy…. sound like yours?? that’s so funny, well, maybe not getting the clean bed dirty… 🙂 They do seem to act abit like dogs I think! Great art, that cat looks so soft! Superb picture. I love the captured character. Thank you, he is a character! Wow, amazing job with this Rebecca!!! It’s like he’s walking right off the painting!